The thirteen essays of this book deal with various aspects of production manage- ment which have shown a growing importance in research, teaching and practice within the last years and are partly neglected in the literature. The contents range from theoretical issues to case studies. Significant relations among different essays (chapters) give rise to group them into four major parts dealing with separate themes of production management: - fundamental organizational aspects of the production process, - general problems and modern concepts of materials management, - joint production with surplus, waste and hazardous byproducts, - production aspects of cutting stock and trim loss problems. Moreover, there is a strong material connection between the contributions to this volume because they all are based on a common conceptual framework emphasizing the production theoretic foundation. 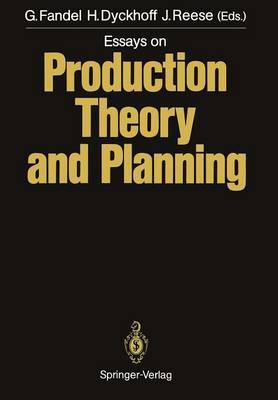 The collection of papers in this book is also designed to provide a fairly comprehensive picture of scientific work in the field of production management done during the last years at the Institute of Production Economics of the Fern- universiUit in Hagen, partly in cooperation with other scientists. Since all but two articles have not been published in English before, the reader gets quite a new view on the results of this recent research.